It’s the summer of 1977. The Beatles officially split up seven years ago but the world’s fascination with the band has scarcely diminished. A Gallup poll makes them the third most popular act among American teenagers behind Kiss and The Eagles. The Beatles at the Hollywood Bowl, which compiles live recordings from 1964-5, was released as an unauthorised new album in May and will eventually go gold in the UK and platinum in the USA. Even the world of musical theatre isn’t immune: a show called Beatlemania, another unofficial production which features soundalikes playing the band’s songs to a slideshow of historic events of the sixties, opens in New York and will run for a couple of years. As for the band members themselves, pretty much anything they do is newsworthy. In August, Paul McCartney is in London recording ‘Mull of Kintyre’. Ringo is working on his sixth solo LP, confusingly titled Ringo the 4th, which on release will only trouble the lower end of the charts. George Harrison split from Patti Boyd several years ago but it’s only in June that the divorce is finalised. And as for John: he’s on extended vacation in Japan with Yoko and Sean where he will announce – and not for the last time – that he intends to concentrate on bringing up his young son in preference to making music. But no matter what any of them says or does, and however much or however little happiness their personal circumstances might bring them, there’s one question that never quite goes away: will The Beatles get back together? In July 1977, reviews and promotional pieces appeared in a number of American newspapers for a comic novel called Paperback Writer. The author was Mark Shipper, a journalist for Creem magazine and the founder of a shortlived fanzine called Flash, which was devoted to unearthing obscure American rock albums of the sixties. The full title of the novel is Paperback Writer – The Life and Times of The Beatles: The Spurious Chronicle of Their Rise to Stardom, Their Triumphs & Disasters, Plus the Amazing Story of Their Ultimate Reunion. In fiction at least, the dream that The Beatles might someday get back together can become a reality. Rock & roll. . .has always been fundamentally rooted in irreverence and disrespect. It is a joke! But it’s the greatest, funniest, longest-lasting joke of all time. Warming to his theme, Shipper confirms that the book we hold in our hands “is a rock & roll novel”. The implication is that we should prepare ourselves for the author to poke fun at everything about it by means of a fabricated history of the biggest band of them all. 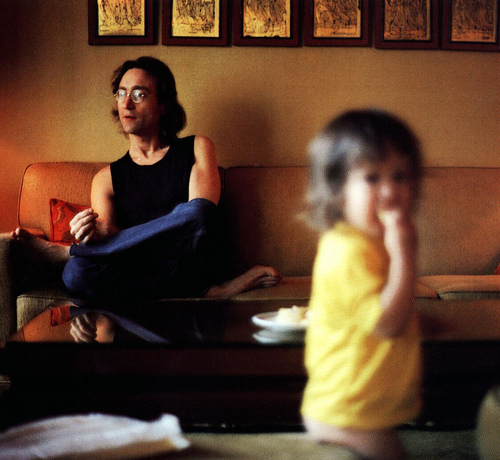 Beatle and son: John and Sean in Hong Kong, 1977. The Beatles ballad version of this song utilized a string quartet (the first such use by a rock group) and contrasted sharply with the sizzling, up-tempo rendition that Casey and Finch took to the top of the charts in 1976 as members of K.C. & the Sunshine Band. More ingeniously, Shipper reveals that John Lennon actually first met Yoko at an early Rolling Stones gig at the Crawdaddy Club, Richmond, while she was the girlfriend of Mick Jagger. Lennon is completely entranced by her, while she is far from impressed and mocks the Beatle for writing “soppy pop material” instead of the uncompromising R&B of Jagger and friends. Asked by Andrew Loog Oldham if The Beatles have any songs they can spare for his charges, Lennon rushes home and writes the R&B-inspired ‘I Wanna Be Your Man’ – inspired too, of course, by that initial meeting with Yoko Ono. From this it will be apparent that much of the humour of the book depends on a fairly full knowledge of Beatles history. You might manage a smile at the thought of the Fab Four knocking out an early disco hit on Help!, but if you don’t understand the allusion to the band’s use of strings on ‘Yesterday’, then you’re missing half the joke. The songs, Dylan insists, are just “‘Words and Phrases! Phrases and Words!”’ And to prove the point, he sets about writing a song with John and Paul, challenging his guests to toss him vocabulary and promising them that he can make use of anything they come up with. The result, composed amidst tears of laughter and thickening clouds of dope smoke, is a brilliant piece of doggerel called ‘Pneumonia Ceilings’. Shipper includes a facsimile of the lyric sheet and can’t resist noting that the original copy on hotel writing paper is “valued at $75,000!” It’s a lovely scene, which manages both to debunk the genius of Dylan while at the same time keeping hold of the idea of the three songwriters knocking out a piece of nonsense for the hell of it. 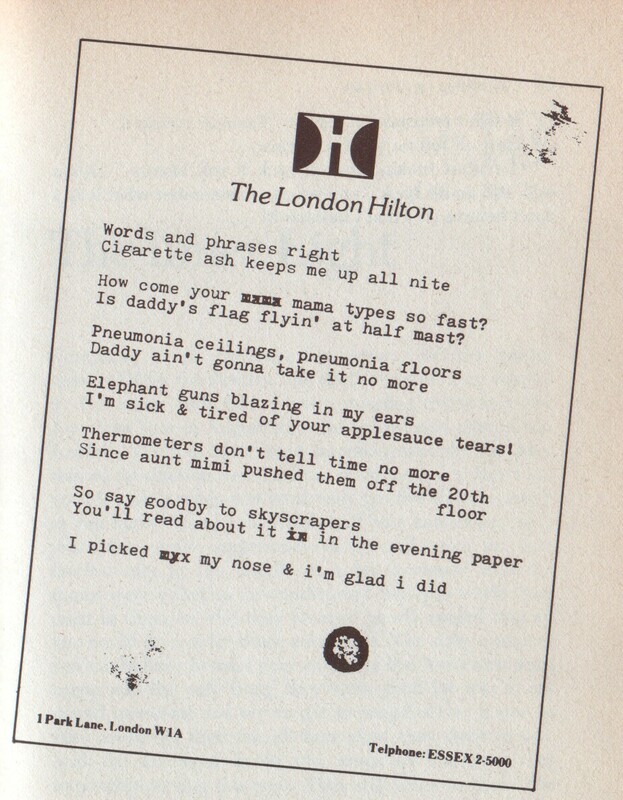 (From the book): The incomparable ‘Pneumonia Ceilings’. Apart from a hollow laugh at McCartney’s solo work, Shipper has stopped making jokes by this point. Instead, he explores how a conversation about late-career creativity might play out between the two songwriters. The scene becomes a poignant one as we realise that even with the most astoundingly creative people, the brilliant ideas may slow to a trickle, or simply dry up. And it’s how you react to that lack of ideas that can define you as an artist. 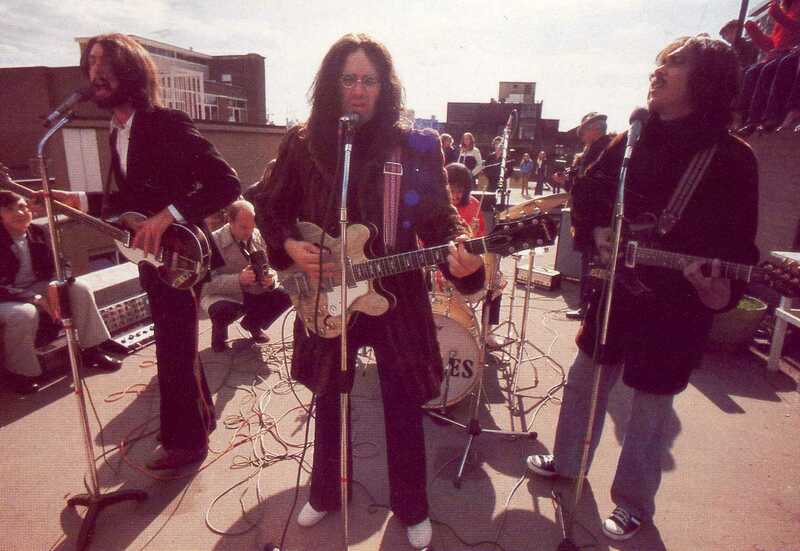 The Rutles: If you were after a jokey tribute to The Beatles in the late seventies, you were, frankly, spoilt for choice. 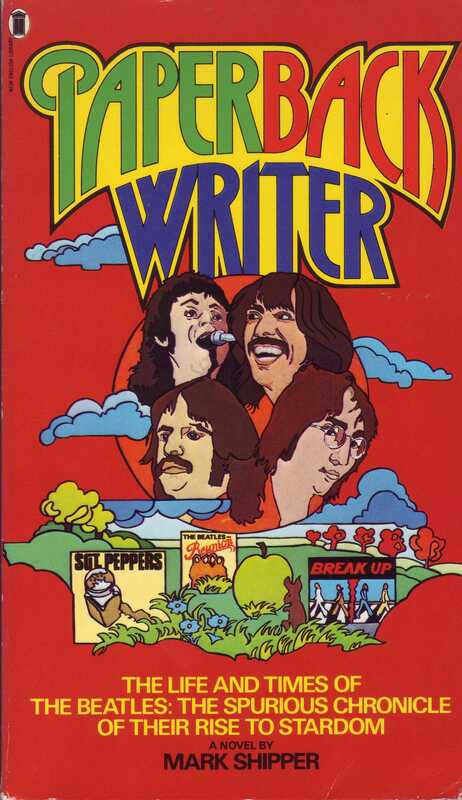 Paperback Writer has something of a cult reputation, helped by the fact that the book has been out of print for years. When I started researching it, I found numerous comments online from people who’d read it when it first came out and remembered it as hilarious. My experience of it has been rather different. Yes, it’s fun and it’s silly and even The Beatles – especially, you might say, The Beatles – need to have the mick taken out of them. George Harrison certainly thought so; he was the one who supported his friend Eric Idle in the creation of The Rutles and loved the joke so much that he had a cameo in their 1978 film, All You Need Is Cash. But what sticks in my mind after reading the book is not so much the devoted good humour that Mark Shipper expends in scooping up his confetti history of The Beatles, but his insights into the creative process along the way. Shipper may ultimately have seen the music he loved as one big brilliant joke, but it’s his willingness to tap into that music for something more serious that makes Paperback Writer more than the sum of its jumbled-up parts.